I don’t know where my brain is this week. This past weekend I made the party soups. At some point earlier in the week I realized that I was off and we were actually making Baked Apples. So I bought the ingredients for apples and somehow managed to squeeze them in after work. And what did I do last night? I sat down a wrote a post for next week’s party soups. Where is my brain?! Well, I guess I won’t need it next week because I’ve already and made and written the post for the recipe. So here I am, trying to squeeze in my post for the Baked Apples before Friday turns into Saturday in my time zone. It’s not going well so far. First I had to check Facebook and find out what everyone was up to. Then I had to catch up on yesterday’s Jon Stewart. And then I started thinking about my Baked Apples. But the trouble with trying to blog about food is that it tends to make you hungry. Especially if it’s dinner time and your husband is running late. So I wandered into the kitchen to find a snack. And there is was, one sad-looking leftover baked apple which appears to have passed its sell by date. Which I guess also sums up how I felt about this week’s recipe. Because, if I’m letting leftovers moulder, it means that we didn’t love it. This entry was posted in french fridays with dorie and tagged Around my French Table, dessert, seasonal - autumn. Bookmark the permalink. Sorry this was not a winner for you. They do look quite nice…hopefully you enjoyed the party soups, better! We love baked apples and have for years. They are a “go to” dessert in my house! Have a great weekend! Sorry the Baked Apples did not work for you. There is always next weeks recipe which you have already made:) It feels great to be ahead of the game. I am watching my pre-recorded Jon Stewart right now… glad you aren’t crying over baked apples I can’t wait for the brest either. On to the next dessert! But my first ever baked (whole) apple thingy..
Bummer. Hope the soups were good, at least. Sorry this wasn’t a winner for you. I am curious as to how the soups are going to work out – I have had the ingredients sitting in my fridge for a week, but I just can’t bring myself to make them yet. Better get cracking, right? Ah I am sorry you weren’t inspired by this one. I wouldn’t have had much to say either had it not been for my mishaps! Looking forward to the Brest too!! PS: how much did you LOVE those soups? They were a total revelation! Sorry you didn’t love it! We did! I’m eager to hear what everyone thought of the party soups. We didn’t have much of a party with them:) Our next dessert is pretty delicious! Too bad you didn’t like this, especially after the extra effort to fit it in. You’ll have a breather for next week though, with the soups and post all done. Nice. I found the baked apples to be OK. I made just one so there weren’t any leftovers and that was fine by me. I guess I’ll be eating a lot of soup this week. Three soups and my husband will be out of town. I missed a basting session as well. Sorry this wasn’t a hit for you. We enjoyed them, but I think I’m looking forward to the soup even more. You wondered where your head was this week – I actually used cider vinegar instead of cider ! Egad. Perhaps even worse, I never knew there was an issue…even after we all ate it. I figured it out when I read another’s note on P&Q’s. (resolution for 2014 to read those BEFORE cooking). Glad you knocked out the soups- you will be so happy next week when it is time to post and you are all ready to go !! I remember than when I went on my honeymoon in Argentina, we came across a version of the Daily Show that was shown in CNN (rather than Comedy Central). I’m not sure if it was a special, but it seemed like there was a weekly international version for out of the US. I enjoyed the apple for breakfast. It didn’t seem like the most festive of desserts. Bummer that these were not a winner. 😦 I hope the party soups were a bigger hit! Bummer that this was not a winner. 😦 Maybe the party soups were a bigger hit? Sorry you didn’t love it – but kudos for making it at short notice. 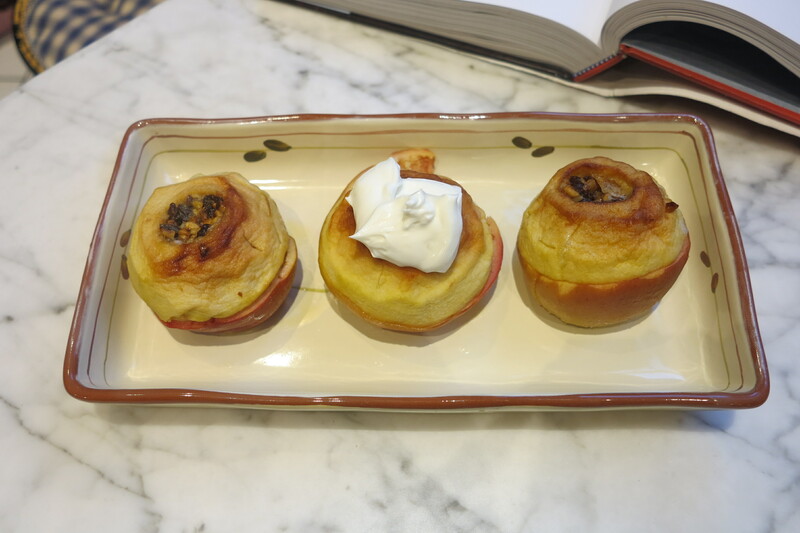 This recipe reminded me of the baked apples Mum made when we were kids, so it was a nostalgic trip for me. I’m with you. These weren’t my favorites either. But it was fun to eat the topping! I take full credit for your thinking this was party soup week. I posted P&Q for the Party Soups instead of the baked apple before Diane corrected me, reminding me that I was a week off. So, that’s what you saw and that’s why you made them. My bad. Thanks for not naming names in your Post!!!!!! I liked this since I’ve always had plain baked apples so the “dressing up” made them even better. These were a part of my midwestern upbringing. Sorry this wasn’t a winner at your house. Sorry this wasn’t great for you this week. Hope everything is well in your corner and that the last dessert this month is a winner – though I’m sort of scared of it. I’m sorry you didn’t like this one. It’s funny, just last night I was trying to think of the last time I let a dessert go bad. It’s been a long time! I have my favorites, but in my book almost all desserts are good.